This is the second in a series of three articles highlighting the Report Solution Patterns and Recipes from Chapter 7 of Professional SQL Server 2005 Reporting Services. As we have endeavored to solve various business problems, we’ve learned to do some interesting things with Reporting Services. On consulting engagements, I often find myself in front of a client who is asking questions like “Can you do this or that?” Almost inevitably, the answer is “yes,” but the question becomes what the best method would be to meet the requirement. With a little outside-the-box thinking, a lot of interesting things are possible. This may involve some custom programming, embedding report items or using customer application components in concert with Reporting Services. In the following article, I’ve compiled a description of reporting challenges and solutions we’ve encountered when developing reports for our clients. For each “solution recipe,” I provide a brief list of skills, techniques, and resources needed to apply the report feature. This should give you a good idea about how prepared you may be to use the techniques based on your skill set and the level of complexity. Some of these are easy to duplicate and others require more advanced skills, which may include Transact-SQL and Visual Basic programming. These are not intended to be exercises or step-by-step instructions. I have made a point to provide enough information to demonstrate the concepts and techniques. Microsoft Office Business Scorecard Manager is a Back Office product that integrates with SharePoint Portal Server and may be used to bridge the features of several Microsoft products, such as SQL Server Analysis Services, Excel, Visio, and Office Web Components. BSM is primarily designed for the nonprogrammer, power-user and requires little technical expertise to create dashboard-style reports. Using Reporting Services and a little programming savvy, it’s possible to duplicate some of the BSM features without the product. This type of reporting scenario has quickly become a mainstay in enterprise business applications. Also known as executive dashboards, business scorecards provide summary level progress and success status information for business leaders. To understand and appreciate the value of this type of reporting interface, you need to walk in the shoes of corporate business leaders. A typical corporate officer deals with a lot of people and a variety of information in a day, and often needs to make immediate decisions based on this information. 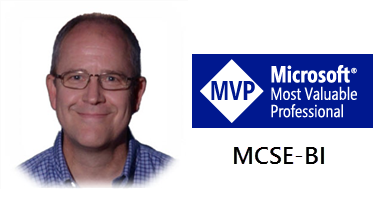 Moving from meeting to meeting, transaction-level details are too granular for most decisions. Business leaders need to know how the business is performing overall and whether there are areas of concern or notable success. I’ve sat in a lot of meetings with a General Manager or Director sitting on one side of the table and subject experts on another. The officer begins by saying, “So, how are we doing?” The subject expert gives a lengthy presentation, stepping through PowerPoint slides, charts, graphs, and diagrams that depict trends and variances based on mountains of data. After the presentation, the officer concludes with the question: “So, how are we doing?” Scorecards and dashboards answer this all important question using succinct summary values and simple graphical, symbolic progress indicators. Although simplification is a key concept, scorecards go beyond just keeping reports simple. Trends and success indicators should be clear and easy to understand but should provide an avenue to discover more detail and to view related trends and summaries. These objectives are easily achieved using drill-down and drill-through report features. These are the fundamental concepts behind business scorecards. For any given measurement, a target is simply an objective value. Targets are often data-driven values like a Budget, Quota, Baseline, or Goal. A KPI, or Key Progress Indicator, is a set of thresholds used to measure actual values with the target. KPIs may define banding indicators that to signify a range of variances like poor, acceptable and exceptional performance. KPI thresholds may be a single point, corresponding to the target, percentage, or fixed increment offsets with any number of indicator bands. When considering longer-term trends, you may want to recognize the difference between a positive trend using a KPI and whether or not a value represents a successful outcome, as a KSI (Key Success Indicator.) For example, sales for a particular product may have been unprofitable since it went on the market. If sales are rising, a KPI would show positive sales growth while a KSI would indicate that the company is still in the red. We might simply define two targets, one to measure short-term progress and the other to measure overall profitability. Indicators are graphical icons, representing the state of an actual value with respect to a KPI band. On the scorecard, corresponding indicator icons might be red, yellow, and green symbols. Indicators are typically common symbolic metaphors like traffic lights, colored shapes, progress bars, gauges, and directional arrows. Figure 1 shows some common indicator graphics embedded in a sample report. Variance is the difference between an actual and target value. If time variances will be used extensively, the queries used to make these calculations can be very intensive. Aggregating and calculating sales totals, for example, for a given month over last month, quarter, or year can require some heavy-duty query processing (even with a modest number of detail rows.) Ideally this type of data should be stored in a data mart or data warehouse with precalculated variance values stored in the database. The AdventureWorksDW database contains some preaggregated summary values, but as you can see, even for this simple report with only year-over-year variances, the query is fairly complex. When running complex queries like this one, you may need to increase the default connection timeout setting on the data source. The default setting is 15 seconds, which may not be sufficient for this query on all hardware. In a production application with data volumes greater than the sample database, I would recommend testing query performance and possibly using an Analysis Services database with cubes and precalculated aggregates. To populate the data warehouse, you will use queries similar to this one and store the results for later retrieval. Figure 2 shows a simple table with two groups: on the SalesTerritory and CalendarYear fields. This table is much like several previous examples. The detail row is hidden by default allowing for drill-down using the SalesTerritoryRegion textbox. Two more images will serve as indicators. These are based on expressions used to change the indicator image. 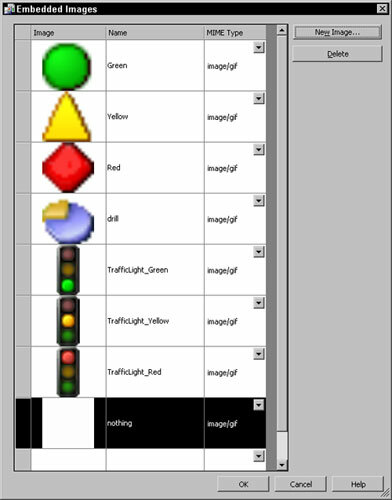 You will notice that the images have a white background even though I’ve used background colors to separate the rows. I’ve only done this to simplify this example. I have simply added the images to the cells in the table header. If you want to use transparent images over a colored or shaded background, you will need to add rectangles to the header cells and then place images in the rectangles. This way, you can set the BackgroundColor property for each rectangle and take advantage of the image transparency. The final example, shown in Figure 6 (on the final page of the article), uses this technique to fill the background color behind the scorecard indicator images. Looking at the columns with text headers, the first column contains the SalesTerritoryRegion field in the first group header and the CalendarYear field in the detail row. The second column contains the EmployeeName in the detail row. The third text column is for the SalesAmountQuota field. 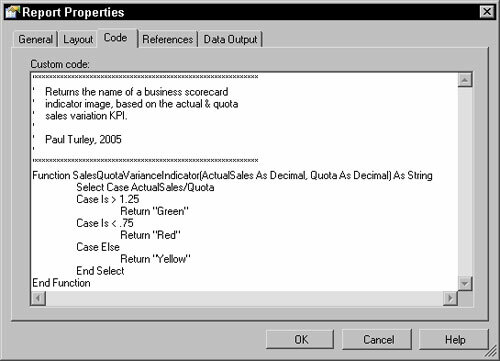 The header uses the SUM() function to aggregate the details for the sales territory. 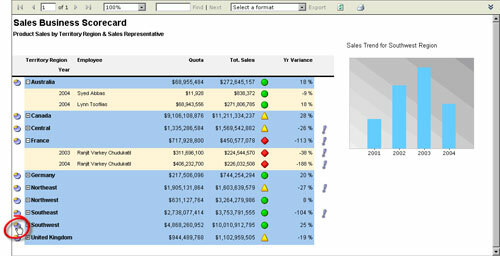 The fourth text column contains total sales values, using the ExtendedAmount field. The last column of textboxes, labeled Yr. Variance, calculates the total sales amount annual variance. In the header row, the expression uses the SUM() function. In the detail row, the SUM() function is omitted. The expression for the sales first set of indicators (the images column after total sales column) calls a Visual Basic function to apply the KPI threshold banding. Figure 3 shows this custom code. For variety, I’ve resolved the second indicator column images using only an in-line expression, rather than using a custom function. This is the expression for the header row. The detail row expression is the same but excluding the SUM() function. As a rule, after I’ve decided to use custom code, I’ll typically continue to use custom functions for all but the simplest expressions so I can keep business logic in one place. The following is intended as all one line but will not display that way with this page width online. This expression returns the name of an exclamation mark icon image when this year’s sales amount is less than 80 percent of last year’s. I created an image file called “nothing,” which is a blank icon with a white background. Using this image effectively displays nothing in the image cell. One of the great advantages to the scorecard approach is that all the information is presented in a concise page. In order to make the best use of screen space, I can use a separate report item to show content related to the item selected in the scorecard. Figure 4 shows the table and chart items. When I select a sales territory, by clicking on the small pie chart icon in the first column, I want to see sales trend information in a column chart. I’ve placed a chart to the right of the scorecard and have configured it as a column chart. I’ve also simplified the chart by removing the legend. The chart content is synchronized using a report parameter. The SalesTerritoryKey parameter is used to filter the dataset providing data to the chart. 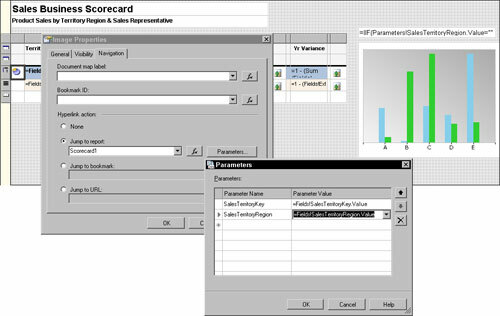 The SalesTerritoryregion parameter is used to provide a title value for the textbox above the chart. Figure 5 shows the Navigation properties for the pie icon used to synchronize the chart. Note that the Jump to report property is set to navigate back to this report, re-rendering the same report with the new parameter values. Figure 6 shows the rendered report with some region sections drilled open. I’ve clicked the pie icon next to the Southwest region to synchronize the chart and view sales trend details for the southwest region. Again, note the background color fill behind the scorecard indicator images using the technique I mentioned earlier. One of the first things you’ll probably notice is that the quota and total sales values are not very close at all. These values have actually changed in different editions of the AdventureWorksDW sample database as it progressed through beta testing cycles. For this report example to be more realistic, you can manually change some of the SalesAmountQuota values in the FactSalesQuota table. The completed sample code on the book’s support site, at P2P.WROX.COM, contains a script to update all of the quota values. This article is the second in a series of three articles from Paul Turley excerpted from the 90-page chapter, “Report Solution Patterns and Recipes” from the book Professional SQL Server 2005 Reporting Services, written by Paul Turley, Dave DuVarney, James Counihan, and Todd Bryant (Wrox, 2006, ISBN: 0-7645-8497-9). The full chapter contains a deep analysis of successful report projects, including project profiles, success factors, user discussions, and scope management. Templates are provided to assist requirement gathering and management. The Report Recipes section of this chapter includes 19 specific examples of advanced report designs that implement custom coding and other techniques taught in previous chapters. This series of articles demonstrates three of these examples. The first article was Greenbar Reports and the final installment will be Creating Sparklines. Hitachi Consulting has business and IT consulting offices throughout the world. Paul works for Hitachi’s Pacific Northwest Business Intelligence practice in Seattle and may be contacted at pturley@hitachiconsulting.com.